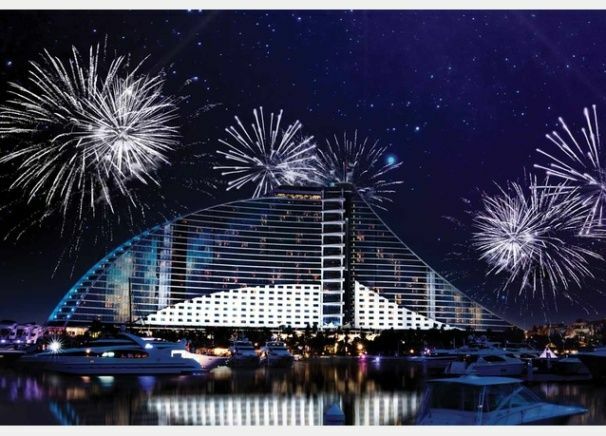 Dubai New Years Eve 2019 is one of the most awaited moments by everyone around the world. Each year, Dubai organizes one of the most beautiful new year events, you never able to see anywhere. It’s a popular new year destination among the travellers from around the world. Each year, the number of tourist attractions during new year are increasing. We are 100% sure that, you would have an amazing experience by spending your new year celebrations in Dubai. You should not have to worry about your trip and pleasure in Dubai, as the city offers everything for all age group, and activities. Do not forget to reserve your hotel now to get confirmed hotel reservation as well as less rates on new year dates. Which is the best hotel for new year celebrations in Dubai? Let’s see! Burj Khalifa is one of the most visited tourist attractions in the world for New Years Eve celebrations. From previous year, they have started showing light-show instead of fireworks for the viewers. It’s an amazing place to see people from all around the world, happiness on their faces to see an amazing event. It’s a great opportunity to have lifelong memories with your loved one. To have seamless experience, Traveljee strongly suggests you to stay near the Burj Khalifa for easy access to the site. It is one of the best and easiest ways to reach Burj Khalifa during new year moments. 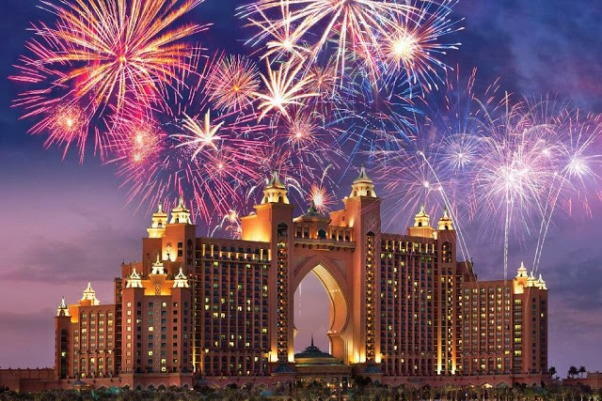 For Dubai New Years Eve 2019 best staying experience, we strongly suggests and recommends the following hotels to stay. 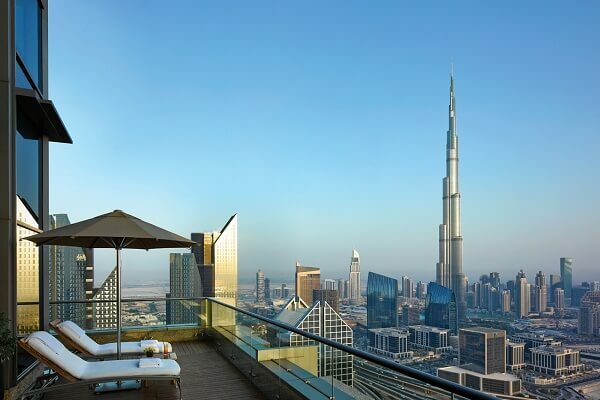 For hotel reservation (best hotels near Burj Khalifa), then visit this webpage for amazing deals and best prices guaranteed. 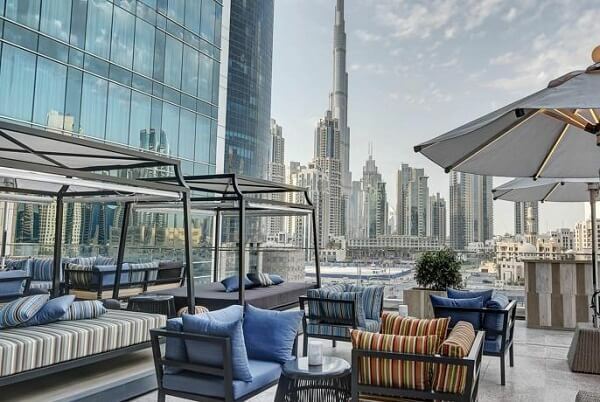 Sofitel Dubai Downtown is one of the most beautiful and amazing hotels in Dubai to spend your new year. 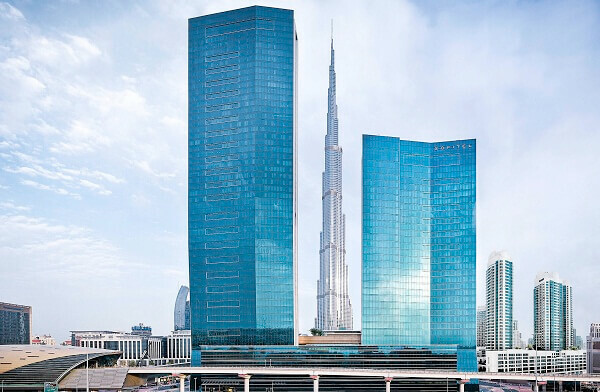 The hotel is located just 0.6 km from Burj Khalifa, the focal point of celebration in Dubai. You could easily watch amazing fireworks and lighting show from your own room, if located on upper floors. It is the preferred hotel near Burj Khalifa for amazing view of other skyscraper on new year fireworks. To get amazing hotel deals with lowest rate possible, then please reserve it from this link. I think, Atlantis, The Palm do not require any introduction for travel lovers. It is one of the best luxury hotels in Dubai to spend your precious moments. They are located on Palm Jumeirah, a beautiful and peaceful place to welcome new year. They organizes one of the best New Year’s Party in Dubai. We strongly recommends you to reserve your hotel room at the earliest from our recommended portal. Did you require any introduction to this amazing hotel chain? The hotel offers an amazing view of Burj Khalifa, the focal and centre point of the celebrations. You could easily watch Burj Khalifa’s fireworks as well as many other new year fireworks held in Dubai, if your room is located on upper floors. To get the best available rates in the market for new year dates, we strongly recommends you to book from our recommended portal / website. Steigenberger Hotel – Business Bay is a popular luxury hotel to celebrate and stay in Dubai for new year celebrations. They offer one of the best views of Burj Khalifa for watching amazing lighting show and other fireworks. They are popular in Dubai to watch amazing view of the NYE fireworks. For best rates available online, please visit this portal. Jumeirah Beach Hotel is a beautiful hotel and amazing tourist attraction for the celebrations of new year party / event in Dubai. They organizes one of the most amazing New Year’s Eve fireworks in Dubai. As the hotel is located on beach, you would have an amazing experience of celebrating new year with nature instead of locking up yourself in concrete buildings. So, hurry up! Reserve your hotel room at Jumeirah Beach Hotel from this link to get good deal. Besides the above mentioned popular hotels / places, Palm Islands is considered as one of the unique places / destinations in Dubai to welcome new year. 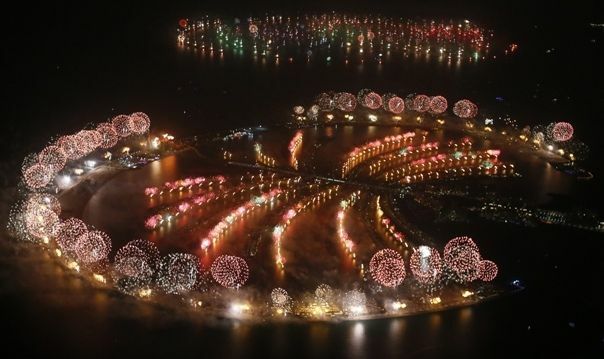 A lot of popular and luxury hotels are located near the Palm Islands to get amazing view of NYE fireworks. Movenpick Hotel Jumeirah Beach, Sofitel Dubai Palm Apartments, Sofitel Dubai The Palm Resort and Spa, and Jumeirah Zabeel Saray are recommended hotels by Traveljee to stay near the Palm Islands. Burj Al Arab is one of the most beautiful and luxurious hotels in the world. 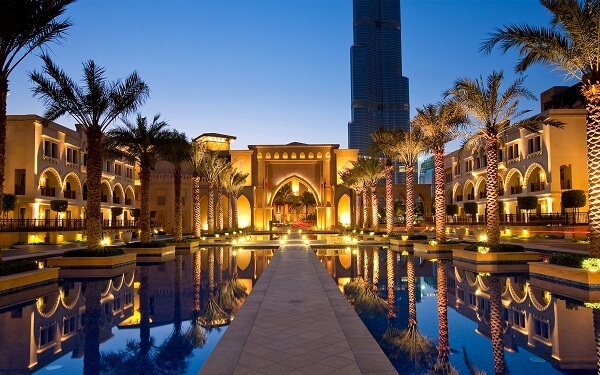 It is considered as one of the best places to stay in Dubai for new year’s celebrations. Due to it’s popularity, people starts booking / reserve their hotel room as early as after completion of previous new year! I think, you didn’t require more introduction to this best, and most luxurious hotel in the world. Do not forget to reserve your hotel room from our recommended portal to get best hotel deals. 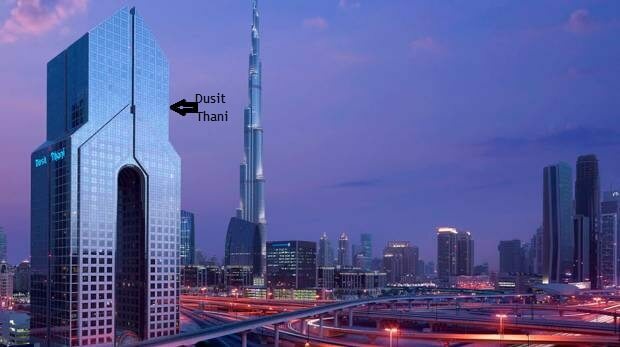 Dusit Thani Dubai is a world class luxury hotel, located in the prime location of Dubai. 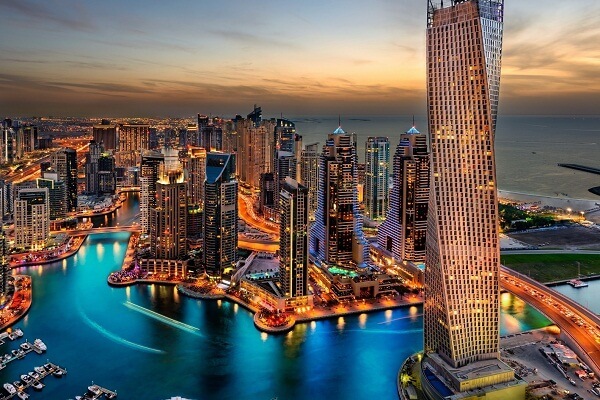 It offers an amazing view of the world’s tallest tower “Burj Khalifa”. From the top floors of Dusit Thani Hotel, you can easily view amazing new year’s fireworks. A special new year’s dinner is being organized each year at the hotel which includes amazing experience. Apart from the view of fireworks, the hotel makes every effort to make your new year stay one of the best moments in your life. Quickly get your deal from this webpage. Only a few rooms are available for new year week. Palace Downtown Dubai or The Palace Hotel Dubai is a wonderful luxury hotel in Dubai to make your new year holiday one of the most memorable moments in your life. Hotel Palace Downtown Dubai offers one of the best view of Burj Khalifa’s new year’s fireworks. Only a few rooms and suites are available for new year holiday week. We strongly recommends you to reserve your room/suite as soon as possible from this webpage here for the best available rates. Besides the above mentioned hotels, Traveljee strongly recommends the following hotels to stay in Dubai during new year. To get one of the best deals for above mentioned hotels in Dubai, then visit this webpage here to get best rates for new year holiday week. The lowest prices are guaranteed by our hotel reservation partner! Hello! Where can I go to see the fireworks in Dubai without some reservation? On the beach? In some street? It’s dangerous? Thanks. Shabina hello, we have recently moved to Dubai on the Palm, in the Anantara residence (within the hotel complex) Can we get good view of the firewaorks somewhere nearby? Hi G, I prefer to see beautiful fireworks at Burj Khalifa and Burj Al Arab. It’s difficult to suggest you good fireworks view from your place as I haven’t visited it! Its Better if you go to Dubai Mall and you Watch Burj Khalifa there , its not dangerous at all. I am visiting there every year. Hello. Where can I buy tickets for the White Night Party at Dubai Mall? I am looking for the best hotel near Burj Khalifa. Please suggest one for Dubai New Years Eve celebrations, parties, events and fireworks. I am looking for the best rates for the given below hotels in Dubai. Already have an apartment rented for the 31st,looking for some good options to celebrate 31st party and fireworks this year.Please send me some info thru email. It’s good! Burj Khalifa is the best place to see the beautiful fireworks in Dubai. Atlantis, The Palm, Burj Al Arab, and Palm Jumeirah are another important locations where you could see the beautiful fireworks in Dubai.